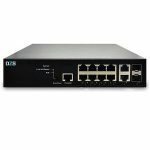 Home / Training / Technical Resources / Component Video vs. Composite Video? What’s the Difference? There are an array of different connector types for audio visual equipment, but basically they all fall into two camps: digital and analog. Older devices use analog signals, while newer ones use digital signals, and they each have different types of connectors to get everything to work together. In a home theater, analog signals usually use one of two different connector types: composite or component. 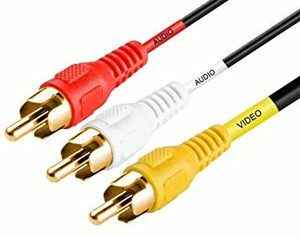 Composite RCA cables feature one yellow connector for video, and red and white connectors for audio. Component cables use the red and white audio connectors, but they divide the video into three components: one for luma (brightness) and two for color information. This is known as YPbPr component video. Component and composite audio-visual connection cables both transmit video via an analog signal. But that’s where the similarities between the two formats end. Old-style composite cables are no longer supported by most devices. The newer component cable format was designed to work with modern high-definition devices. 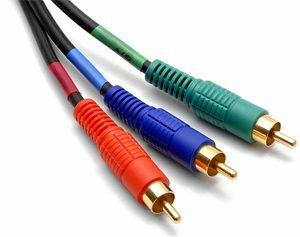 However, even component cables have had their day – high-resolution HDMI is now typically the connection of choice for the latest generation of audio-visual equipment. A composite video cable — also known as an RCA or “yellow plug” cable — is an old standard that transfers a video signal through one cable and connector. It doesn’t support HD content or progressive scan images. Because the video signal is forced to travel through a single cable it is heavily compressed, losing much of its resolution and picture clarity. The cables also suffer from radio frequency interference, which further degrades picture quality. Composite video is a dying technology, because it can’t support HD video signals. When given the option, go for component over composite every time because this connection will always provide a better picture at higher resolutions. The only practical use for composite video today is when using older equipment, such as older video game systems or VCRs, which do not support the component video format. Because of this, some new HDTVs include at least one composite video input to make them compatible with old equipment. Component video splits the video signals into three cables — green, blue and red — with each transmitting a specific component of the video signal. The green cable (also called Y) transmits the brightness information of the signal. The blue and red cables (called Pb and Pr, respectively) transmit the blue and red components of the picture’s color. Green components are inferred by a combination of all three signals. Since component video is spread across three separate cables, it does not need to be as compressed as composite video, allowing support for HD resolutions as high as 1080, as well as progressive scan images that create smoother images with more defined edges. Component cables initially replaced composite as the de facto analog video cable, thanks to its improved picture quality and HD support. Nearly all HDTVs made today have at least one set of component inputs. Component video is also supported by most video game consoles, DVD players, digital video recorders, cable set-top boxes and Blu-ray players. Component video cables are analog, just like composite cables. And also like composite cables they have inherit limitations that are tied to the analog format. Analog cables transmit their signals via waveforms, digital cables transmit their signals the same way a computer transmits data — through binary code that is decoded by the display device into a viewable picture. 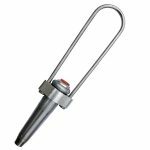 Because they travel via waveform, analog signals are susceptible to interference from radio waves and other electronic signals from nearby equipment. Analog signals also have less bandwidth than digital signals, which means increased compression that can negatively affect picture quality. Although less noticeable with component than composite, signals transmitted via component cable will not be as clear as signals transmitted digitally via cables like HDMI and DVI. Most HDTVs use HDMI (High Definition Multimedia Interface) connectors, which use digital signals. Digital signals give you better sound, higher resolutions, and better color than analog signals. Multicom stocks the highest quality HDMI 2.0 cables you can buy, at a fraction of what you’ll find in a retail store. Currently our MUL-HDMI-2.0-1.8M-MA-MA-HS-30 – High Speed HDMI 2.0 Cable with Ethernet – is on sale on our Online Store for $1.15 each (with FREE SHIPPING)! While regular television signals, VHS tapes and laserdiscs all encode visual data using lesser quality composite video, DVDs use component video for encoding visual data. A DVD player with component video outputs, connected to a television with comparable inputs, will provide a picture far superior than one using composite video connections. Component video is also a step up from S-Video in that it is a multi-scan technology, which means it can deliver the video stream in differing modes to accommodate various frame rates for progressive-scan or interlaced televisions. Component video cables are available in different configurations. All three cables might be encased in a single sheath with triple tails at each end, or the cables might be bonded or ribboned together. Three single RCA or coaxial cables can also be used, but should be the same length and type. 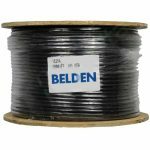 Increased cable quality, tips and shielding add to the cost, as will the length of the cables. Many people have numerous free cables around the house from purchasing past equipment, and some people opt to use these to connect component video. Bear in mind that standard cables are color-coded red and white, so care must be taken to match the green, red and blue jacks with the same wire on both pieces of equipment. Cabling made for component video is color-coded green, red and blue for this reason. It is also usually of higher quality and might have better shielding coverage and lower impedance levels. If results are unsatisfactory using standard cables, a cable upgrade might make a difference.